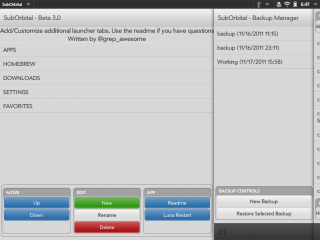 SubOrbital allows you to add, remove, and rename additional launcher tabs for the webOS Launcher. You may not change/remove/rename the existing tabs (APPS, DOWNLOADS, FAVORITES, SETTINGS), but you can add and name your own. SubOrbital by grep_awesome is licensed under a Creative Commons Attribution-NonCommercial-ShareAlike 3.0 Unported License.